"The Bourke Engine Runs On An Incredibly Lean Air/Fuel Ratio! It Produces More Horsepower And Torque Per Pound Of Fuel Than Any Other Piston Engine In History! It Has Only 2 Moving Parts! The Oil Never Has To Be Replaced! It Runs Very Quiet! It Runs Much Cooler Than Conventional Engines And Produces Much More Power Due To Its Extremely High Thermal Efficiency! Perhaps The Most Efficient Piston Engine Ever Invented!" PRESENTING The most valuable and efficient fuel powered piston engine ever made! Where it's from! How it works! How to build one! David S Wolfe Founder of Bourke-Engine.com. Considered the most authoritative website on the Internet when it comes to the Bourke Engine. He has consulted with and inspired many Bourke enthusiasts including those who have successfully fabricated their own Bourke Engines! RE: The Incredible Bourke Cycle 1 Stroke Engine! 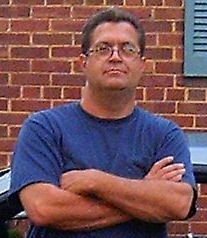 After I got out of the Army in 1978, I put my experience working on Military vehicles to good use and began making a good living at it as a civilian. I started up and ran a fairly successful mobile auto repair business called The Auto Doctor. A few years later, I found out about the Bourke 1 Cycle Mono Stroke Engine I couldn't get over just how rugged, simple, light weight and efficient and clean running it is! I was fascinated by it and set out to learn everything there is to know about it! You see, in my younger years, my mind was fresh and unfettered by conventional 'wisdom' and open to the truth! I found that truth in Russell Bourke's engine design! The man impressed me so much that I dedicated my life to making this data known to all and get this technology out into use where it can do the whole world some good. My websites have been online since 1998! The Bourke Mono (1) Stroke Cycle Engine technology has been available for decades and should be put to good use! It's thermal efficiency is reported to be over 97% under certain conditions! The Bourke Cycle Engine became what I understand to be the most desirable of operating characteristics and performance of IC engines! I learned everything there is to know about it by studying The Bourke Engine Documentary, which was originally released in the 1960s only a few years before Russell's untimely passing. Years later, as it turned out, I discovered some very rare knowledge about the Bourke Engine that was left out of The Bourke Engine Documentary! I proudly make available to you now! CHECK OUT ROGER AS HE PLACES HIS HANDS RIGHT OVER THE EXHAUST PORTS - EXHAUST GASSES THAT ARE ONLY WARM TO THE TOUCH YET SHOULD HAVE CAUSED DEVISTATING SEVERE BURNS! PROOF THAT MORE THERMAL ENERGY IS BEING CONVERTED TO POWER! One cool thing Russell states in the Documentary is, "There's gold in them cylinders!" Not just a fortune perhaps but super GREEN efficiency! Extremely simple powerful and environmentally friendly which is my main focus, drive and passion for getting this technology into use! I've always been environmentally consienceous hence, my passion for such GREEN technologies in general! Russell Bourke was way ahead of his time! You'll soon see this when you read The Bourke Engine Documentary. He wanted to prevent the environmental pollution and damage that conventional engine technology was then and still is causing to our environment! As it turns out, he knew what he was talking about too! A key aspect of the Bourke Cycle engine is that it actually RUNS CLEAN near ZERO to ZERO harmful emissions as it converts thermal energy into POWER and TORQUE! When you get your hands on this Documentary, you'll learn exactly why this is! You'll see what I'm talking about! The Bourke Cycle One Stroke Engine is extremely easy to understand once you grasp the simplicity of its operation! What is this Bourke Mono or One Stroke Cycle? It operates in a unique way that is contrary to what many people incorrectly believe. It has nothing to do with the way conventional internal combustion engines operate. It is very different! You see, after the piston reaches top dead center, the combustion area has built up a Flame Free high pressure charge ready to send the prime mover (piston) on the down stroke - how is this possible? The answers are revealed in The Bourke Engine Documentary - Bourke Cycle Engine Edition! OBSERVE THE INCREDIBLE SIMPLICITY OF OPERATION! One thing I realized from reading Russell's words is "Simplicity is the key to Efficiency!" You'll not only be able to acquire The Bourke Engine Documentary, this special Bourke Cycle Engine Edition is an exclusive release only available here. This PDF has 202 pages filled with the most concise eye opening information on Russell Bourke's Engine that has ever been released! THE BOURKE ONE STROKE CYCLE - This is KEY information not found in the oriignal Bourke Engine Documentary! Data that is critical to duplicating the Bourke Cycle Engine so that it performs correctly. You won't find this valuable data available anywhere else! ALL ABOUT THE BOURKE ENGINE AND HOW IT WORKS... - Exclusive New Release! BOURKE ENGINE OPERATION MANUAL - An exclusive release not available elsewhere! The original scanned documents with notations on them written by Russell Bourke's own hand. This covers general starting procedures, troubleshooting data and more! A MUST HAVE! 1958, BOURKE 400 4 CYLINDER ENGINE DISAPPEARS! A Decades Old Mystery! EXCLUSIVE NEW Bourke-Engine.Com RELEASE! - Scanned notes on people who were actually involved with Russell Bourke showing what transpired as the large 400 cubic inch Bourke Engine was wrested from his control and shelved!. THE BOURKE ENGINE PATENTS - These cam be found online, but I've included them for your convenience. There are 3 US patents, 1 Candadian and 1 French patent. Below are two different blueprint sets that I'm offering. It's best to get both sets in addition to the Bourke Engine Documentary - Bourke Cycle Engine Edition. With all three of these packages, you'll be armed with the most valuable Bourke Engine knowledge in the world! 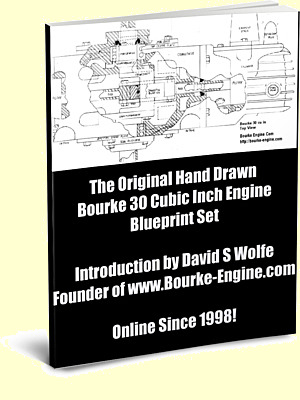 I'm also making these hand-drawn blueprints for the Bourke 30 cubic inch engine available. I re-compiled these Blueprints with the intention of putting the know-how into the public's hands so we can get this engine out there and in to widespread use! There are 40 hand-drawn Bourke 30 Prints covering all parts of the engine as well as 29 photographs of completed engine parts! These prints are invaluable if one considers what goes in to producing them! The Latest Modernized CAD Blueprint drawings created for the purpose of clarifying the Original Hand-Drawn Bourke 30 Blueprints. The Bourke 30 CAD Blueprints give finer detail and clarity over the original hand drawn blueprints! Theyre They are based on the drawings and actual mechanical measurements of a real Bourke 30 cubic inch engine! These drawings are extremely valuable, especially if you are going to attempt to build your own Bourke Cycle Engine! You also now have access to high resolution images taken of our own Bourke 30 original production Engine 015. Hand made by Russell Bourke himself. Receive A HUGE DISCOUNT When You Purchase Together! Russell Bourke's professional bio and why he set out to develop the Bourke Engine in the first place! The complete operating theory behind the Bourke Cycle Engine! The Bourke Engine Formula is also included! It comes directly from Russell Bourke and details specific information on successfully replicating the Bourke Cycle Engine. This was not included in the original Bourke Engine Documentary, which was published back in the late 1960's. You'll see this transcribed in clear type. The original scans of the documents are also included. All About The Bourke Engine - How It Works. A very rare article released exclusively by Bourke-Engine.com - included in this book. Operating Instructions - EXCLUSIVE and includes Russell Bourke's own handwritten notations. An EXCLUSIVE release! 1958, Bourke Engine 400 Disappears - The REAL Story! An exclusive release found and made available by the Founder that has never been made public until now! You can read the actual notes regarding the suppression of Russell Bourke's 400 engine! David Wolfe's Animated GIF of the Bourke Engine. This is free online but is included for your convenience. Russell Bourke's Original Patent Collection - included are 3 United States, 1 French & 1 Canadian patent on the Bourke Engine. Available online too but we've included them in this set for your convenience. 40 blueprints hand-drawn found and recompiled by the Founder with details on the 30 Cubic Inch Bourke Cycle Engine. This has some measurements that are not included in the CAD blueprint set so you should get both sets. 39 high quality CAD Blueprint drawings. You should also get the Hand-Drawn Blueprints together with this set. SUGGESTED RETAIL PRICE, WHICH IS WHAT I HAVE SOLD THE SAME PACKAGE FOR ON MY WEBSITE EXCLUDING THE NEW DOCUMENTS IN THIS LATEST EDITION! Get your hands on a copy of the "BOURKE ENGINE DOCUMENTARY - BOURKE CYCLE EDITION AND BLUEPRINT SETS" right now. Then take some time to read, learn and be amazed, and see for yourself that this is the most powerfully effective material you have ever read on high efficiency engine technology! If within 60 days, BOURKE ENGINE DOCUMENTARY - BOURKE CYCLE EDITION AND BLUEPRINT SETS hasn't convinced you that the impossible is possible... or if you're unsatisfied for any reason at all! Simply write me an e-mail saying so and I'll refund your money. We Promise! You have up to plenty of time to check out THE BOURKE ENGINE DOCUMENTARY - BOURKE CYCLE ENGINE EDITION AND BLUEPRINT SET to broaden your knowledge and awareness when it comes to such energy technologies -- risk free! Get Your Hands On A Copy of THE BOURKE ENGINE DOCUMENTARY - BOURKE CYCLE ENGINE EDITION AND BLUEPRINT SETS Now! 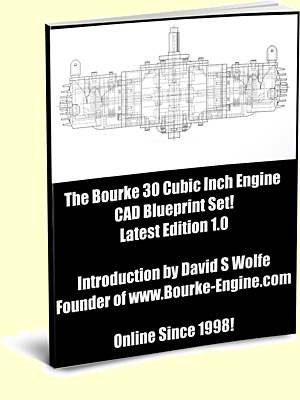 BOURKE ENGINE DOCUMENTARY - BOURKE CYCLE ENGINE EDITION AND BLUEPRINT SETS Now! Dude!, I'm ready to add the fantastic Bourke Engine eBOOK set to my collection right away! Give me THE BOURKE ENGINE DOCUMENTARY - BOURKE CYCLE ENGINE EDITION AND BLUEPRINT SET now so I can begin to enjoy gaining this valuable and eye opening knowledge right away!. After I submit my order, I get immediate DOWNLOAD access to everything. 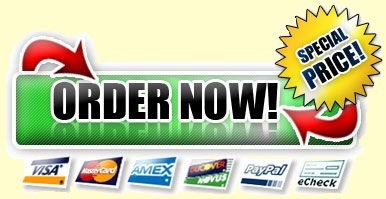 When I submit my order, I'll receive immediate download access! The link for downloading your eBooks will be sent to you via email. 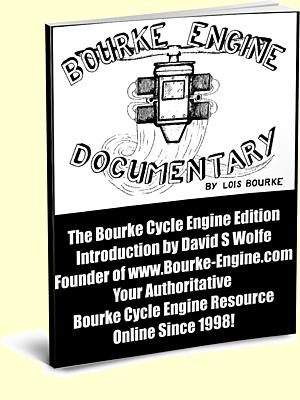 Get THE BOURKE ENGINE DOCUMENTARY - BOURKE CYCLE ENGINE EDITION AND BLUEPRINT SET right now and read them carefully. You'll see that these eBooks share the most current and concise information on Bourke Engine technology at ANY price! 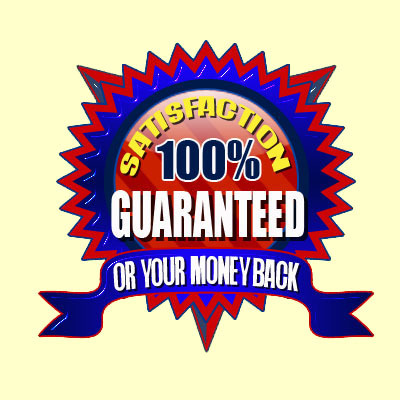 I know our product will meet or exceed your highest expectations!